The Astrogeographical position of the EU Parliament in Brussels shows highly important resonating degrees for all topics related to the European Union. The astrogeographical coordinates are 22°Pisces and 8°Scorpio. The Astrogeographical positions of capitals: Rome, Washington, Ottawa, Moscow, Beijing, London, Paris, Madrid, Berlin, UNASUR, EU, Kiew, New Delhi, Kabul, Riyadh, Bagdad, Tehran, Pyongyang & Seoul, The Hague, lslamabad, Damascus, Jerusalem, Athens, Ankara, Brasilia, Canberra, Caracas, Mexico City, Tokyo, Wellington. United Nations, Vienna, Warsaw. 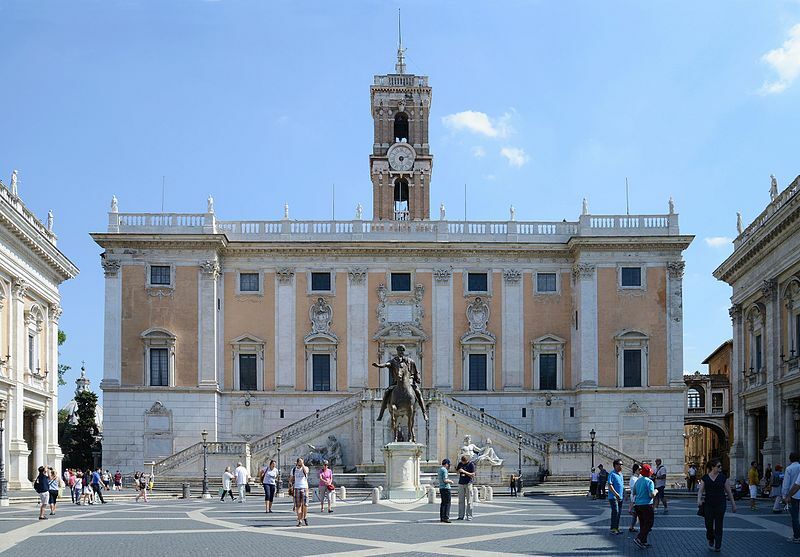 The European Union was founded on 25 March 1957 at 18:30 through the treaty of Rome, which was signed at the Palace of the Senators on Capitoline Hill in Rome. The site of the signing of the treaty stands for the roots of the European Union in the Roman Empire and its successors the Kingdom of the Franks and the Holy Roman Empire. The signing countries Belgium, Netherlands, France, Luxemburg, Italy, Germany were all involved in the Empire of the Francs that succeeded the Roman Empire from the 5th to the 9th centuries. Astrogeographical position of Rome for morphogenetical field level 1 which defines the supranational role and meaning of Rome: the area around Capitoline Hill together with the nearby Forum Romanum has both coordinates in air sign Gemini the sign of communication, technology, practical solutions, roads, learning, language, going new ways, neutrality and of bringing opposites together. One coordinate lies on 29° Gemini and the other on 15° Gemini. Gemini is in many ways the perfect indicator for the rise of technology in the Roman Empire, the outstanding ability of the Romans to assimilate the useful aspects of other religions and cultures and the readiness to bring different nationalities, origins and cultures together. This special resonance of the City of Rome supports an openness and neutralityin relation to technological and cultural innovations which is unprecedented. It not only explains the success of the Roman Empire but also of its successor the multinational Holy Roman Empire which existed for 1000 years until it was wiped out by the changes brought about by the French Revolution and its envoy Napoleon Bonaparte in 1806. Astrogeographically the capitals of the founding members (Belgium, Germany, France, Italy, Luxemburg, Netherlands) of the European Union are linked together by a Grand Cross which seems to create a circle of tension and also of completion. The capital of the European Union is the City of Brussels in Belgium which is situated in a region that lies in the astrogeographic constellation of the two water signs Scorpio and Pisces. This combination of signs is valid for morphogenetical radius/field level 1 and describes the astrogeographical qualities of Brussels on a supraregional, global level. The two coordinates can be used as significators to identify the energetical topics, qualities and given situation of Brussels in its role as the capital of Belgium and the European Union. It consists of an interactive complementary opposition and square between the points of view as represented by the different seats of govenrment: Berlin lies at 29° Virgo in straight astrogeographic opposition to the dutch capital Amsterdam at 29°Pisces and to a minorextent also to the position of Brussels at 22°Pisces. At the same time Paris the capital of France`s position on 28°Sagittarius falls in opposition to Rome at 29° Gemini indicating a traditional tension between the capital of France and the seat of the Pope in Rome in his role as a direct ally with the Holy Roman Empire. Altogether the astrogeographical strucure appears to creates a sort of “interactive roulette” at the bottom of the European Union. The Treaty of Rome was signed at sunset and with service-orientated, aristocratic air sign Libra the sign of relationship, harmony, balance, justice, peace, decoration, naive painting and angels rising. Venus on 29°Pisces (the position of Amsterdam) in house 6 shows the central issue of the options for security, reason, peace and optimal use of ressources. 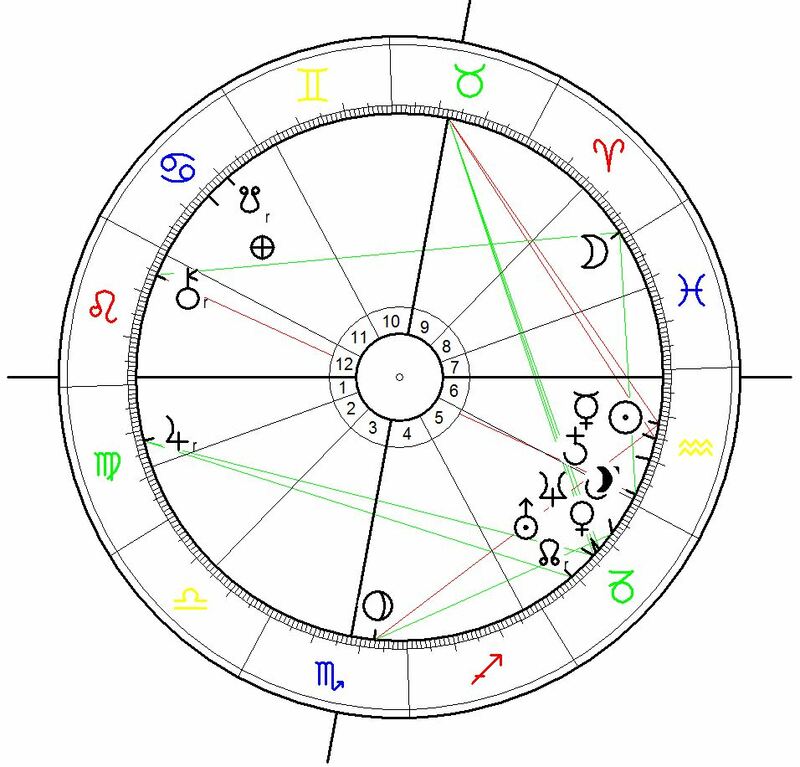 The blocks of self-liberation, self-finding and awareness of the fuller potentials of the single countries is the main problematic issue of the EU as represented by the position of Pluto at 28° Leo (the astrogeographical resonance degree of Washington) in house 11, the house of true friends. The ambiguity of the role of the USA in relation to the West-European countries as their helper, saviour, liberator, inspirator, protector and in other ways their hypercapitalistic downpressor can be seen here as a topic that existed right from the start. Pluto as the ruler of house 2 the house of one`s own territory reveals the military dependence of the EU founding members from the USA in the times of the Cold War. For the role of house 2 as the house of economy: economically Pluto (aka Washington) represents a helper and motor for development. But at the same time Pluto represents the foreign rule over house 2 – the European territory as well as the European economy. 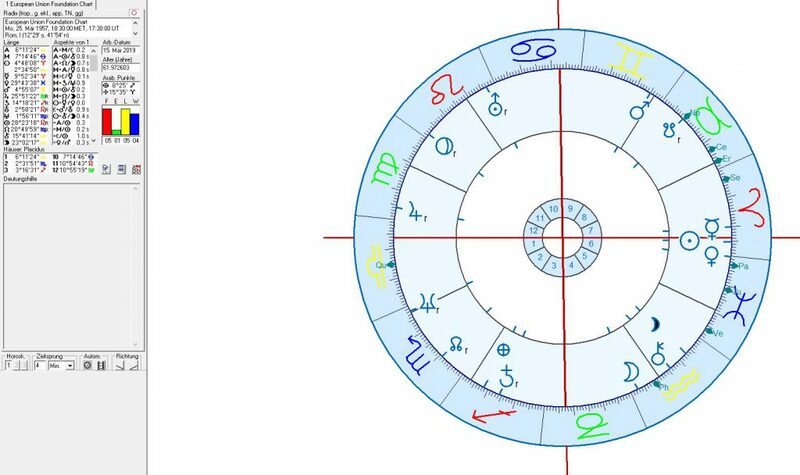 And through the position of Neptune on the cusp of house 2 the founding members appear as indecisive, unable, not allowed or simply not willing to control their own territory. 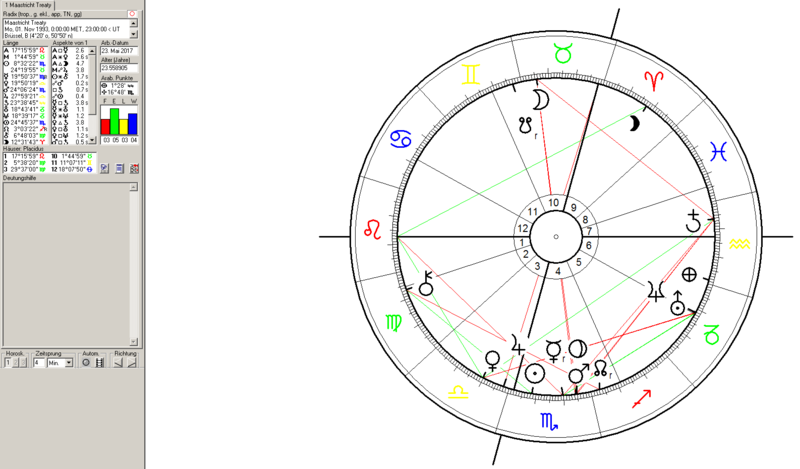 Apart from that the relationship to Russia the largest european country appears even more problematic because of a T-square of Uranus, Neptune and the Moon at 2° in their signs in highest tension with the astrogeographic position of Moscow at 2°Taurus. This constellation alone reflects that the EU was an attempt to stabilize Western Europe against the East European block of nations due to the Cold War. Saturn at 15°Sagittarius being right on the astrogeographical position of the spanish capital Madrid in house 3 classically the house of neighbours reveals an intense resonance of the Treaty of Rome with the future EU member Spain that can be understood to play an important stabilizing role in the EU in times to come. 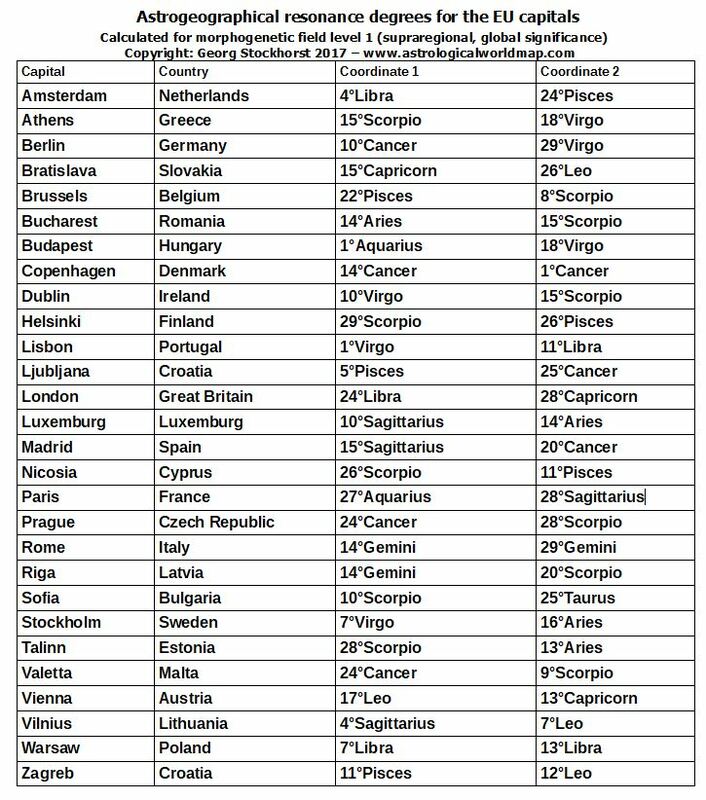 The European Union was founded under a T-square between: Neptune at 1°56`Scorpio – Uranus at 2°58` Leo – Moon at 2°34`Aquarius. That constellation explains how the formation of the EU was directed against the soviet/russian colonial expansion during the Cold war process. This is because Moscow`s astrogeographical resonance coordinate is at 2°Taurus. It may help to understand that this tension is by the way with Moscow and not with Russia`s first capital St. Petersburg which is located at 3°Aquarius and conjunct the Moon position of the EU!! The competition between the russian capitals has St. Petersburg (3°Aqu-1°Ari) as the site of the European roots of Russia and Moscow (2°Tau-12°Can) as the administrational/gravitational capital of the russian empire. During the whole year of 2019 Uranus will be conjunct Moscow fullfilling the T square in the EU foundation to a Grand Cross. Astorgeographically it absolutely makes sense that the European Union will have to deal with the pressure and threats from Moscow but also with the blind eye towards the options for a better deal with Russia during the whole year. EU membership of Irland, Denmark and the UK – signing of the contracts on 22 January 1972 calculated for 12:00 noon. 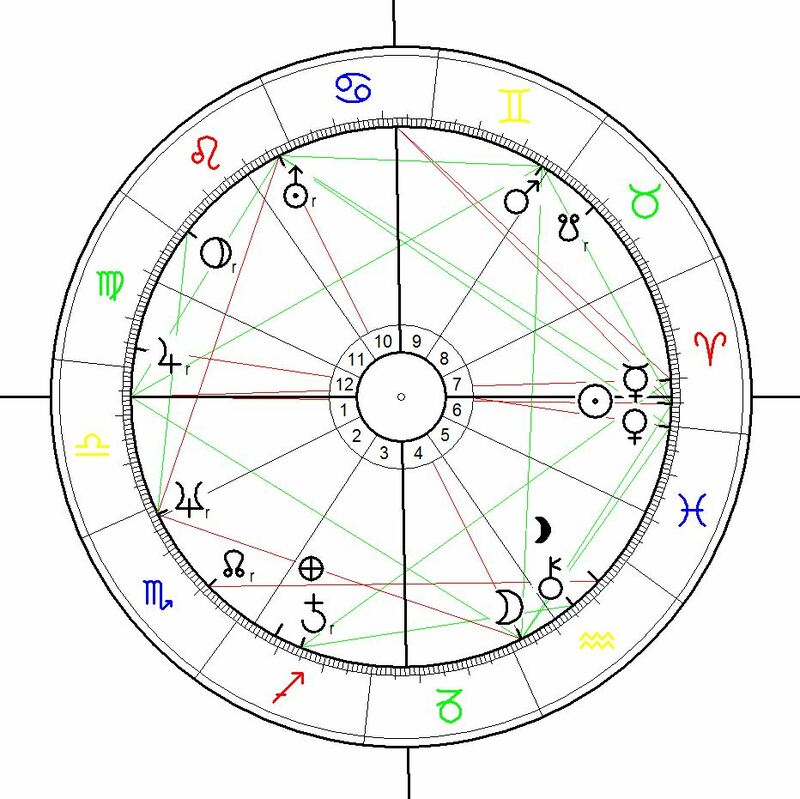 The contracts for the joining of 1973 Denmark, Ireland and the UK were signed on 22 January 1972 with the Sun at 1° and the North Node at 5°Aquarius conjunct the Moon at 2° Aquarius in the EU foundation chart, indicating an intense emotional grounding in the ideal of a brotherhood of the Nations as represented by the position of the Moon in Aquarius in house 4. But that day also had another highly intense topic in regard to the Moon in store: an intensely aggressive Moon-Mars conjunction in Aries in opposition to Uranus the planet of brotherhood or say true friendship in Libra the sign of naive painting. This Moon Mars opposition reveals all the ambiguity of the British approach to the EU. The Moon – Mars conjunction in Aries is an archetypal constellation for british culture anyway. And it really provides a classical image of the emotionality set free by some of the english tourists as soon as they reach the european continent, As that Moon-Mars constellation near 20° Aries was directly opposite Uranus it seems only logical that the Brexit decision of the United Kingdom voters came right at the midpoint of the Uranus cycle at the moment when Uranus had progressed right over the Moon-Mars conjunction of 22 January 1972. Lilith the planet of the supressed unconscious and hidden action at 26° Libra in house 6 was right on the astrogeographical position of the City of London. This aspect brings up the questionb in how far the British influence on EU politics was actually operated by the remote control through the dominant actors of global capitalism seeking ways to control and undermine the autonomy of the rest of the EU members. Or let`s put that thought another way round: it is no wonder that the British government was permanently trying to pay less money into the development of the poorer EU countries than the rest of the EU members because it saw its actual partners and friends not within the EU but outside of it. The Treaty of Maastricht became effective on 1 November 1993. It was at this stage signed by only 13 member states – 15 more of the currently 28 member states joined the European Union after that, the first of which were Sweden and Finnland in 1995. The large group of the former Treaty of Warszaw nations joined the EU between 2004 and 2013. The Treaty of Maastricht was signed with a conjunction of the Sun, Mercury and Saturn in Aquarius in house 6 – and their ruler Uranus conjunct Venus, Neptune and Mars in Capricorn the sign of government institutions. This strong alignment of topics concentrating on Capricorn explains the main issue of the Maastricht Treaty as the creation of an administration and effective legislation for the European organisation of nations. The moon on the second degree of fire sign Aries and right next to the initial degree of the zodiac stands for a new start. The Maastricht Treaty became effective on 1 November 1993. For practical purposes this chart is most commonly used as the initial chart for the EU parliament and administration. The validity chart of the Maastricht Treaty provided the basic legislation for the European Self Help Organisation – the EU. This chart is often called the “Modern Europe Chart” – but that reduces the whole European Self Help Organisation to its legislational structure. There is a lot more to Europe than that. In order to understand the setting of this chart we need to remember the historical situation from which the Treaty derived. November 1st 1993 was a point in history when Perestroika had opened the option for an independent Europe – that would not be stuck between the USA and USSR as it had been over 48 years. Germany (Central Europe) was the area on the planet with more nuclear weapons stationed than anywhere else on the planet. And it was the central nuclear weapons` target for both sides of the Iron Curtain. The Mars-Pluto conjunction in Scorpio is the constellation that reflects the historical background. Pluto in his own sign Scorpio the sign of strongholds, dogma and hierarchical structures with Mars (Iron) reflects the remains from the Iron Curtain between East and West Europe. That was the historical situation and the chart clearly reflects all these issues. 25 years later astrologers are simply not aware of the topics of that period anymore. 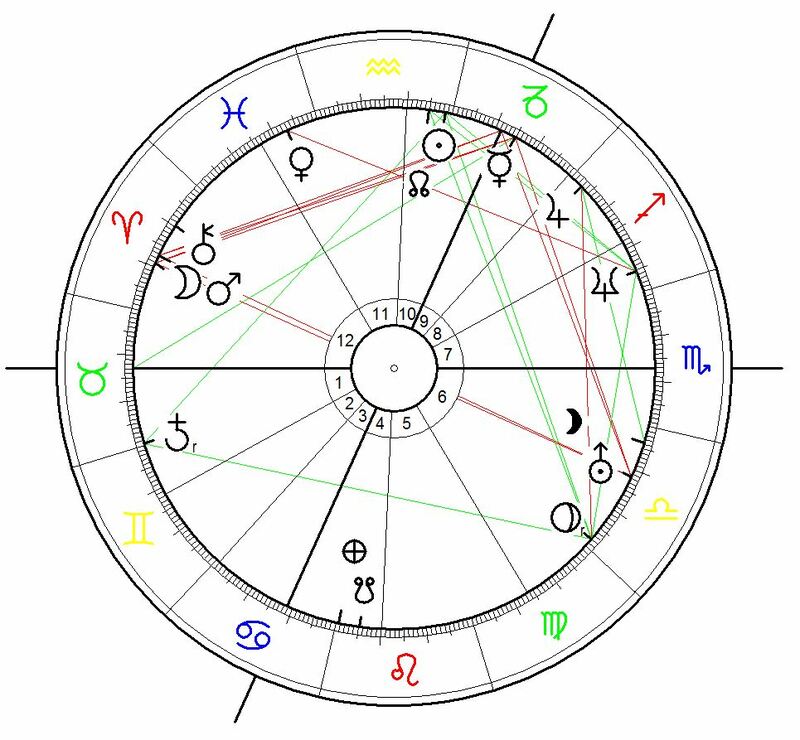 And that`s why they tend to project the “negativity” of that chart into the future without remembering that the Mars-Pluto conjunction in house 4 (house of the past) shows the basis of the situation of the year 1993 while the Moon in Taurus in house 10 shows the future aims. Venus the ruler of midheaven along with the highly profitable Moon position in Taurus was conjunct Jupiter in Libra the sign of relationship, balance, harmony, negotiations and peace. Venus stood for the withdrawal of the Soviet armies and stationed nuclear weapons from Eastern Europe and the british, french and belgian forces from Germany. The Moon in Taurus in house 10 symbolized the aim of a common european market, currency and defense system – confronting through opposition the MA-PL conjunction aka the local hierarchies of the establishment inside the single countries, the iron curtain and the hegemony of the USA and USSR over Europe. 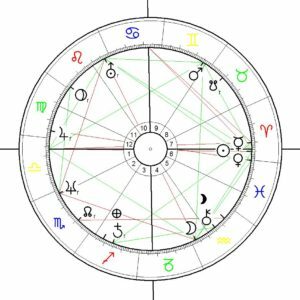 Saturn`s position on 24° Aquarius in house 7 the house of relationships was in exact square with both the Iron Curtain constellation of the Mars-Pluto conjunction and the Common Market constellation of the Moon in Taurus. Saturn`s position implies the role of a mediator as well as the role of a challenger from inside as well as from outside of the Union. Through Saturn`s position in Aquarius the topics of its sign and house ruler Uranus is particularly strong. Uranus` conjunction with Neptune and in Capricorn the sign of government institutions stands for the complicated situation of all european administrations, laws and regulations. But these limitations of the European administrations are to be seen as positive in some ways. The most idealistic interpretation of the Uranus-Neptune conjunction (constellation of paralysis) would be: the weaker the EU institutions the more democracy is demanded to put EU policies into practice. This weakness of the EU makes the big difference between the European Union and other large global players like the USA, China and Russia. It keeps the EU weaker and more vulnerable – as a Veto from any single country can stop any legislation amd decision. This “weakness over strength aspect” is reflected in the Venus-Neptune conjunction of the Signing of the Masstricht Treaty Chart. For the evolution of the EU institutions Pluto`s transit over the institutions born during the Masstricht Treaty signifies a heavy challenge and extreme pressure. Effects from such transits of the outer planets should at any time be seen as highly positive because of their potential effect of challenging the administration and its corruption by hypercapitalist players and keeping it weak and under pressure from the public by all means. The Sun position of the Maastricht Treaty at 8°Scorpio fell right on the astrogeographical resonance degree of Brussels emphasizing the future importance of the city as the EU capital. The decision from the British EU Referendum to leave the EU was made when Pluto the representative of the Iron Curtain transited the Uranus – Neptune conjunction from the Maastricht Treaty. Astrogeographic position of the parliament building of the EU for morphogenetic field level 3 which describes the atmosphere of the building itself: The European Parliament building is situated in the first degrees of dynamic male fire sign Aries the sign of warfare, action, ignition, fighting, speed and as the first sign of the zodiac the indicator for a new beginning. The 2nd coordinate lies right in the center of spiritual water sign Pisces the sign of dreaming, imagination, öegends, fairy tales, reconnection with the spiritual plane and as such the most important astrogeographical indicator for temples. Pisces supports a comparatively relaxing and even peaceful atmosphere and could help remind people of the spiritual plane – that level of existence from wich all materia emanates. Particularly for a supranational institution this aspect could help people get over their nationalist fixations. Pisces is highly typical for parliaments as it supports secrete discussions, hiding, manipulation, corruption and communication through the single parties`defense lines. And as the sign of lubrication oil it can help find a way of dealing with confronting energies and views. In morphogenetical field study Aries as the starting sign and Pisces as the finishing sign both stand for places near the divide between separate morphic fields. The two signs are neighbours so that they meet at 0°Aries. The effect of this is that the combination of the 2 signs in astrogeography indicates the resonance of supraregional matters in a field with these two coordinates combined. The cold water sign Pisces stands for the last month of winter while the warm fire sign Aries is the indicator for the beginning of spring. In this sense their combination stands for the phase of the melting of snow in the yearly cyle of seasons. In astrogeography this constellation is typical for the melting and assimilation of conflicting views, languages, cultures a.s.o.. The combination of Pisces with Aries also reflects the roots of the EU in the Roman (Pisces) and the Germanic (Aries) cultures. By “Roman” I`m referring to the Roman Empire, Italian culture and the Catholic Church all of which have a strong Pisces resonance. By “Germanic” I refer to the north-western european cultures with the supposed origin of the germanic roots in the south of Sweden, Other possible astrological indicators for the roots of european cultures may be: the water sign Cancer for the celtic roots, the fire sign Leo for the greek origins and in another sense for the inheritance through romanic languages and Virgo and Aquarius for the slavic cultures and others. For the site of a parliament the constellation of Pisces with Aries does not indicate easy progress, clear decisions or definite majorities but is in some ways a constellation with the tendency for paralysis and suppressed aggression. It can be assumed that a place in this particular constellation has been chosen, because such a stimulation is needed for a melting pot of national interests on a larger scale. In the foundation chart of the European Union Aries and Pisces fall in the sixth and seventh houses. The position in House 6 indicates that the choice of the construction site puts the focus on the topics of adjustement, reason, self-protection and optimal use of ressources. The position in House 7 supports openness, service orientation, publicity, stage performanc and meeting people. This could indicate that the position of the Union is not self-determined and strong here but rather orientated on pleasing and serving the public stage. The sixth house aspect may indicate stable calculated progress and prosperity. But its position in Pisces also indicates the susceptibility of the European Parliament to manipulation and corruption. 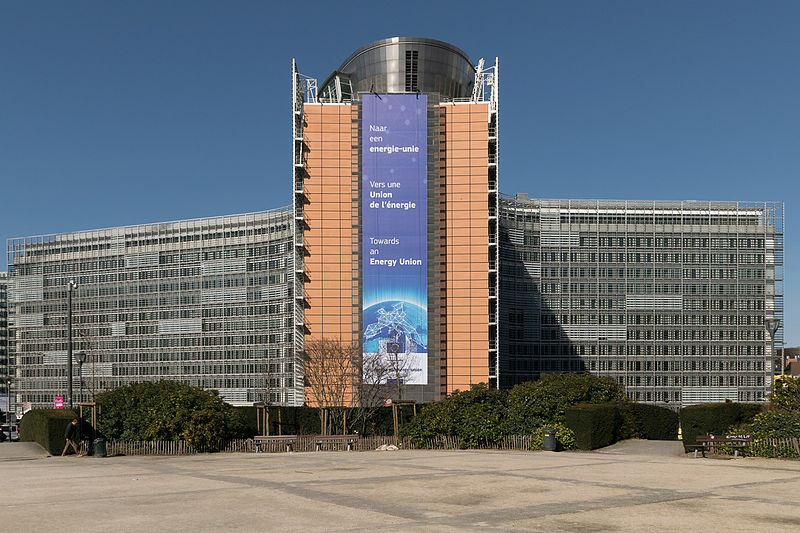 The Berlaymont building, seat of the European Commission the EU`s executive organ or government is situated next to the EU Parliament but not in the same astrogeographical position. It lies in the combination of dynamic male fire sign Aries with creative, innovative air sign Aquarius the sign of the sky, heaven, self-finding, abstraction for morphogenetic radius level 3. In contrast to the site of the EU Parliament this constellation stands for determined action, constant change, mutation and a tendency for gigantomania. Particularly Aquarius stands for the supranational awareness and the desire for an internationalized approach to politics. The foundation of the European Republic has not been realised and it may need another 20 years of inevitable attacks on the European economy and on the EU`s institutions by other leading global players for it to be achieved. But because of the progress in the development of globalizing technologies the foundation of the European Republic is certainly inevitable as a step in the foundation process of a Global Republic (US of Earth) within the next 50 years or so. 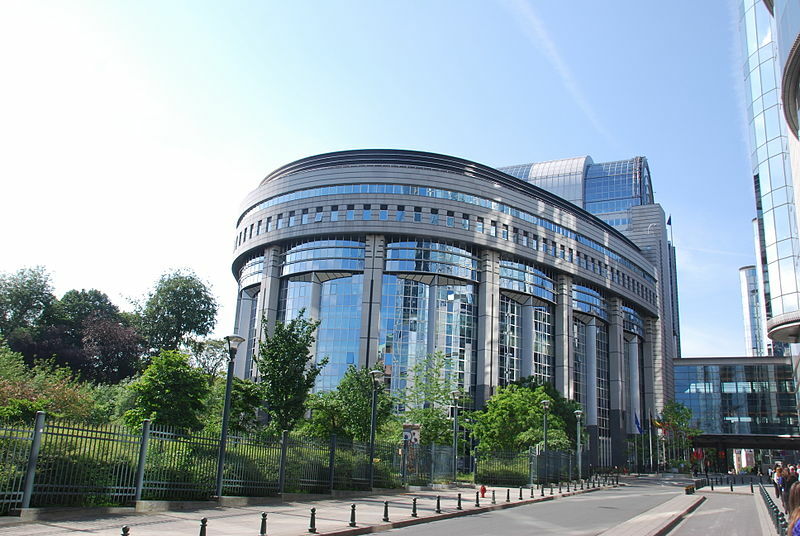 Astrogeographic position of Brussels for morphogenetic field level 1 which describes the supraregional and international meaning of the European Parliament and Commission: Brussels is located at 22°Pisces and 8°Scorpio. Neptune`s transit over the square position to the 8° Scorpio coordinate of the EU between April 2000 (6°Aquarius) and October 2003 (10°Aquarius) marked an extremely important period in the development of the EU. As the ruler of the 22″ Pisces coordinate of the EU Parliament Neptune stood for a challenge of the Scorpio coordinate by the topics of the Pisces coordinate and therefore to some extent for an inner transformation of the Union. The introduction of the european currency on 1 January 2002 was the one of the most important steps in the evolution of the EU. Neptune`s square to Brussels stood for the unification of the single countries across their borders. But Neptune`s square marked also an intense challenge to the EU through the common currency through the corruption included as one or the other county for example Greece did not actually fullfill the criteria that would have made the European Currency helpful for the country`s progress. Apart from that Neptune stood for the intense corruption and pressure exerted on the EU namely France and Germany through the long war campaign in the Middle East (Irak, Syria a.s.o) started by the Bush government in 2002/2003 together with its Saudi Arabian and Commonwealth allies. Pluto`s transit in a square to the EU between December 2003 (20°Sagittarius) and October 2006 (24°Sagittarius) was a similar situation to the preceding Neptune transit. Pluto as the ruler of one of the two coordinates of the EU Parliament challenged the position of the other indicating the need for a further transformation of belief systems and habitual perception. The last major transit of an outer planet in relation to the astrogeographical position of the EU was Uranus transit over Brussel between 19°Pisces in March 2008 and 25° Pisces in January 2010 when the effects of the financial crisis of 2007–2008 hit the worldwide banking system that led to the collapse of the Lehman Brothers investment bank in September 2008. The crisis caused a heavy challenge of European banks, economies and political stability. Severe speculative attacks on the European currency from New York and London based global players which at the same time weren`t allowed to be made on the US and British currencies led to a severe economical and monetary depression in the EU. Saturn`s transit conjunct the position of the EU parliament at 8°Scorpio between November 2012 and October 2013 marked a period of stabilization after the intense challenges during the whole of the Bush presidency and the resulting financial crisis since 2007 and also the climax of the austerity politicy enforced on the EURO zone by the north european countries. 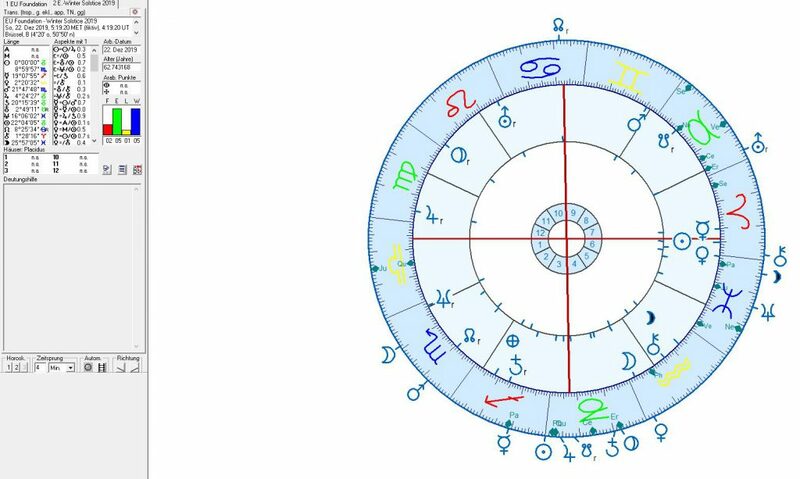 Saturn`s transit square to Brussel`s position at 22° Pisces between December 2016 (19°Sagittarius) and November 2017 (25°Sagittarius) falls in the starting phase of the Trump presidency. The transit signals a new climax of the propagandistic attack on the EU by the new neofascist US and Russian propaganda ministeries. Due to the fact that the EU was founded with Saturn in Sagittarius their effects may not come unexpectedly and can be expected to concentrate on support already existing sources of corruption within the EU. 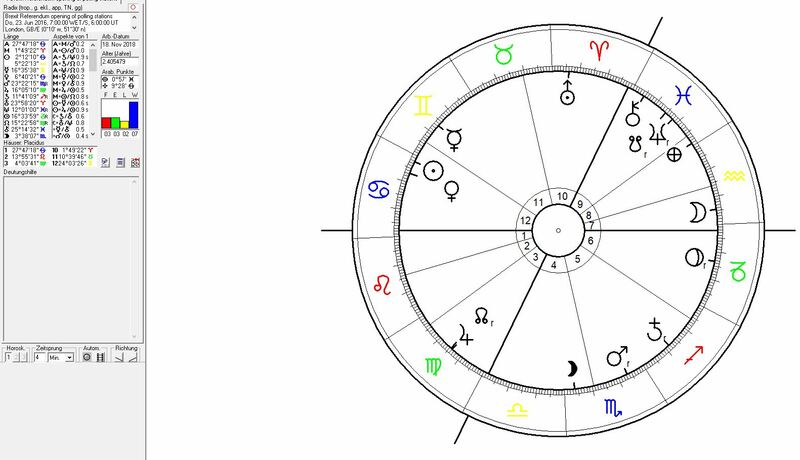 Chiron`s transit conjunct the astrogeographic position of the EU between May 2016 (19°Pisces) and February 2018 (25°Pisces) began with the Brexit decision of the UK. The separation between the EU and UK may be seen as the biggest disaster in the history of EU politics.In the first place the transit of Chiron over the position of the EU reveals the need to reduce spending money and rely more on the community`s own ressources. The EU will be reduced by appr. 16% of it`s economic potential. The fact that the Brexit occured during the transit of Chiron the ruler of Virgo the sign of reason, health, self-protection, conservation, saving money and the protection of nature in conjunction and not in opposition or square could indicate that the shrinking of the EU is a self-healing process. Uranus` transit in opposition to the 8°Scorpio coordinate of the European Parliament between July 2019 (6°Taurus) and March 2021 (10°Taurus) stands for the most acute and intense challenge and threat to the European Union and all its institutions including the european currency and even territorial integrity of smaller member states. As in the case of the Uranus opposition to London during the brexit vote the effects of the expectable neofascist conspiracy headed by the cooperation of the Trump and Putin governments should reach their climax during this period. As Uranus in Taurus stands for territorial claims and attempts to enlarge a country`s territory the danger from intense attacks directly aimed at reducing the EU membership states are to be expected. Saturn´s transits in square and opposite positions to a government are regular challenges that are needed to stimulate the control over institutions and the ruling personnel. The challenge from Aquarius the sign of retracing fuller potentials stands for the challenge through innovation. The next transit of Saturn in a square to Brussels will take place between February 2021 (5°Aquarius) and December 2021 (11°Aquarius). Neptune`s transit conjunct the 22° Pisces astrogeographic position of Brussels between April 2020 (20° Pisces) and January 2023 (24° Pisces) brings the ruling planet of Brussels` position in conjunction with the European Parliament. This period stands for a period in all different sides of Neptune can unfold: the chance for a deeper depression as the condition for a self-healing process of the EU, the demand for a spiritual perspective on the cooperation between the EU members, confronting inequalities and corruption. The stability of the EU relies on its potential and readiness to allow instability.